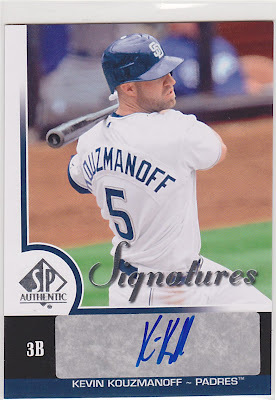 Last night, Kevin Kouzmanoff was traded to the Oakland A's with some other players (ones I don't collect, therefore do not acknowledge) for Scott Hairston. The deal isn't official yet because of the whole pending physical things. However, this is the first time I've had to think about a player I enjoyed collecting getting traded. Some of you may think, well, what about Andy Pettitte's time in Houston? When Pettitte signed with the Astros, I was very (baseball) sad about his leaving. However, at the time, I didn't really focus much of my collection on Pettitte, so there weren't any baseball card factors involved. When it comes to Kouz, the good thing is that he's not on a team I have interest in either way. He also is not going to a team I have any interest in. I'm indifferent toward Oakland. From a card-collecting stand point, I don't think this changes much in that regard. He went from one West Coast team to another. Although, I would have been sad if I was told to move from San Diego. There were other teams looking at him during the offseason such as Baltimore and Minnesota and, I feel, both would have made collecting his cards more difficult. Baltimore and Minnesota have very strong followings. I would have had to fight with guys like Beardy or Topher (I think he collects the Twins) to get his cards. Now, hopefully, the one other Kouz collector on eBay who I've been in bidding wars with won't want his cards. I'm praying he or she is a Padres fan and just doesn't want his card anymores. Although, I bet there are a few Oakland fans I am going to fight with. The trade has done nothing for me. Although, I could change my mind during the season. And, like Night Owl does after his posts, here is a Kouz card that I received in a trade from - what are the chances? - Night Owl himself. 2009 SP Authentic auto. I definitely needed this card. When I saw this on the blog it was the first time I saw this card. A few days later, the second one popped up on eBay. But I enjoy getting the card this way more. He threw in this Derek Jeter card. The guy has good taste. 2000 Upper Deck Gold Reserve. I had two inserts from this set, but not the base card. Is it going to be awkward when the A's play the Yankees? Glad I could spare you from an ebay bidding war. I always get him and that guy from Boston confused. Youkalis. I have had to deal with that a bunch in the past 2 years... Jonny Gomes, Scott Kazmir and Akinori Iwamura were all in my top-5. Kaz went from a local team to a West Coast team so I will only see him when the Angels play the Rays. Its rough, I was going to say at least Kouz didn't go to the Yankees, but YOU would probably like that! I don't know of any A's collectors (well, Mojo Hand) so I don't think you will have much competition there. I guess I am indifferent too. night owl - Not at all. During fantasy baseball season, I would root for the players on my team even if they played the Yankees. Kouz going to A's actually is less beneficial for me. With the NL, he would visit Philly, NY and Washington, which are all within driving distance. With an AL team, he only goes to NY and Baltimore. Canuck - You look like Youkilis! Kouz had a couple early Tribe cards.Other than those, you can still have all the ones I find.Although, I don't don't seem to find that many.Thome was my last favorite player.Since he left the wigwam, I quit collecting his newer cards from other teams.Just give me any Tribe cards and I'm happy! I didn't get on the Kouz bandwagon until he was traded to San Diego. But, I have most of his cards from when he was on the Indians. I'm mostly just missing the higher end cards from his early years.